The Flower Carpet on the Brussels Grand Place is something absolutely worth seeing once in your life. I’m so glad that this summer, I crossed it off my bucket list. The tapis de fleurs (French) or bloementapijt (Dutch), is one of the city’s most famous attractions, as every two years the historical Grand Place gets covered with colorful flowers for a few days. Normally, the viewing of the Flower Carpet is at the Grand Place. This is the central square of the City of Brussels and it is considered as one of the most beautiful places of the world. It plays host to numerous festivals and concerts all along the year. In 1998, it was registered on the World Heritage List of the UNESCO. The Grand Place is surrounded by the guild houses, the City Hall and the Maison du Roi. It has an absolutely stunning 17th century architecture. The combination of Gothic and Baroque styles are beautiful by day and also by night when the area is softly lit by lamps from the surrounding buildings. 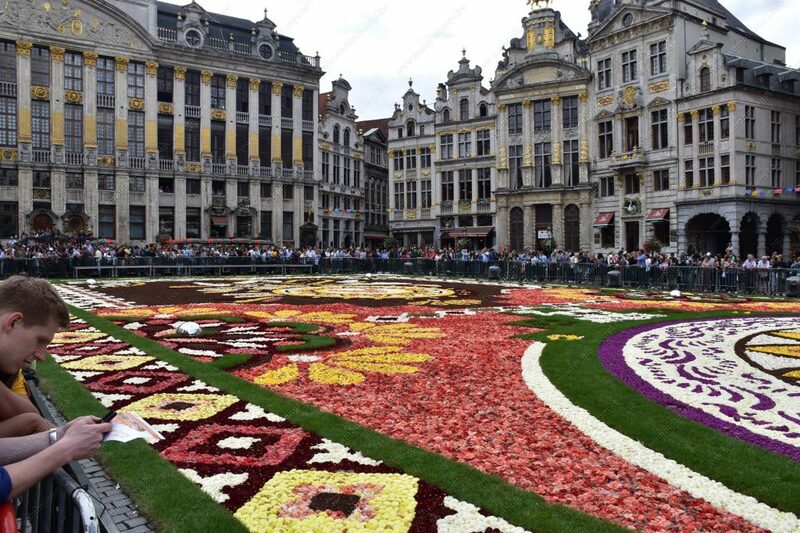 The tradition of the Flower Carpet dates back to 1971 when landscape architect Etienne Stautemans created a flower carpet in the heart of Brussels in an effort to advertise his work. Ever since then, the city has had different designs, all made with thousands of begonias cultivated specially for the event. Indeed, for the first time in its history, the Flower Carpet event organizers this year (2018) adopted a Latin American theme. The Flower Carpet is normally 75 m long by 24 m wide, making a total of 1,800 square metre. Amazingly, a hundred volunteers assemble the carpet in less than eight hours. The viewing of the Flower Carpet, offers a chance to stroll around the Grand-Place, a jewel of Gothic architecture. In addition, the travelers can inhale the fragrant of the begonias flowers and admire the details of the Flower Carpet. This extraordinary event, is made complete by a visit to the balcony of the Town Hall (at a fee), which offers a panoramic view of the work. In addition, a musical theme is especially composed for each edition. A concert is given on the Grand-Place every evening and it is accompanied by a magnificent light show. If you are looking for some interesting things to do during the Summer in Brussels, then this is one of them! People love the fragrance of flowers and good food. After viewing the Flower Carpet, the next adventure in the capital of Belgium, is the Belgian cuisines. Certainly, the Belgian gastronomy is well known and when it comes to eating healthy while traveling in Belgium, the struggle is real. 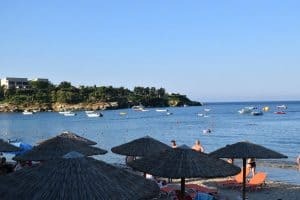 The good news is, there are some simple, yet effective strategies that you can use to help you to eat healthy while traveling. And from my travel experiences, I think that it’s important to be prepared for your trip and just incase everything doesn’t quite happen as planned, just relax, go with the flow and enjoy! Brussels offers some really tasty food that pleases food connoisseurs. There is a whole street full of restaurants which is very near Grand Place. There are also places to eat right or even to enjoy the Belgian cuisine on the Grand Place with very good atmosphere. Don’t forget to try out Belgian Chocolates and also some Belgian beers! Without the shadow of doubt, there are many different ways to travel in Europe but I think that the trains are the most reliable. While planning to visit the Grand Place to view the Flower Carpet, you can probably combine this with something else in the city of Brussels. Fortunately, the Grand Place near by the main train station. Another reason for you to add this to your bucket list! Thank you for stopping by and stay positive!